Throughout my whole New York City life, I have never made it into Prune for brunch or Waverly Inn for dinner. Sad, right? Lord knows I have tried in the past, but my patience wears thin for long waits so when I heard that Chef Ginevra Iverson (formerly of Prune) and her husband Eric Korsh (formerly of Waverly Inn) were taking over the old Belcourt space on 2nd avenue to create Calliope, I jumped at the chance and made a reservation immediately. The fact that they TAKE reservations for dinner is already a huge plus in my book. The space is cute, albeit nothing that stands out; the food, however, can hold it’s own whether it’s surrounded by crystal goblets or fluorescent lighting at Penn Station. Good food need not unnecessary adornment. The menu is comprised of delicious sounding things like sweet and sour braised lamb, homemade malfatti (ricotta dumplings), Provencal tomato tart, and an assortment of “gratins”. Becky and I certainly didn’t know where to start, but fortunately Ginevra made an appearance and gave us some help. 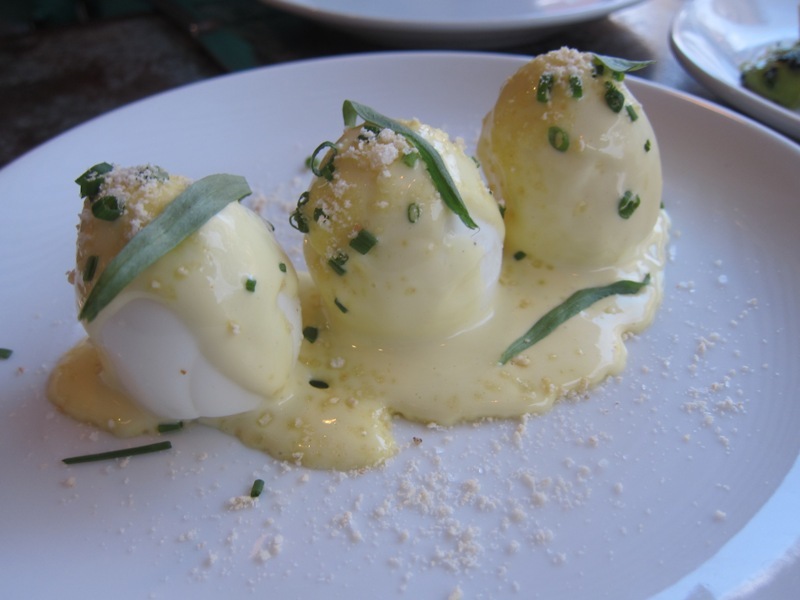 I told her I’m a sucker for a good deviled egg, so the Traditional Eggs Mayonnaise with Celery Salt were calling out to me, and she also suggested the Spicy Mackerel with Avocado and Black Sesame Seeds. I truly believe it takes skill to hard boil or soft boil an egg; I’m 28 years old and I JUST learned how to do this. Calliope’s Eggs Mayonnaise are cooked with skill and a decorative hand – the plate was so pretty I almost didn’t want to touch it. But then I came to my senses and tasted the “mayonnaise”. Here’s another fun fact about me: I hate the smell of mayonnaise. Absolutely hate it. That said, I think it’s needed in certain dishes. The mayonnaise is thinned out here and they make their own celery salt which really helped bring out the flavors – because otherwise I think it could have been a little too mute. Loved it. Protein power! Fish is one of those things that can be as bland or as flavorful as you want it to be; fortunately at Calliope they have a handle on the flavor department. 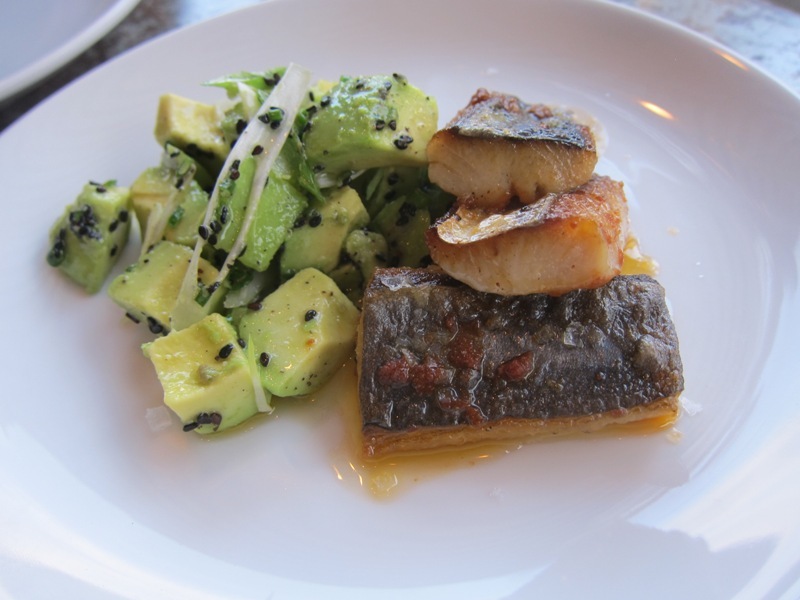 The spicy mackerel with avocado and black sesame salad was delicious and refreshing, with a hint of spice. Could it have been spicier? Sure, but I still enjoyed the balance of perfectly cooked fish and creamy avocado. I think creamy avocado can make almost anything better, but that’s just me. How often do you go to a restaurant, see “roast chicken” on the menu, and sigh whilst rolling your eyes? Just me? Am I the lone roast chicken snob? I don’t know what it is, but the thought of roast chicken always sounds so boring and lame, yet this one stood out to me. 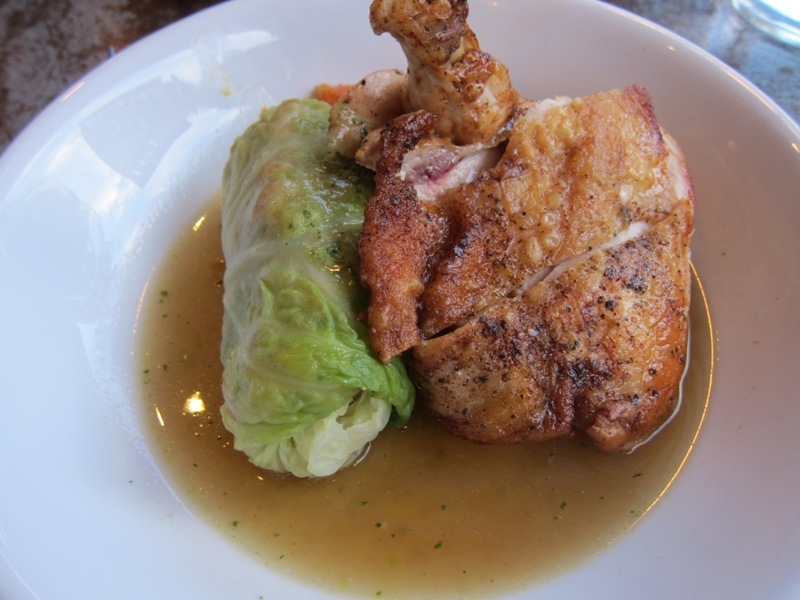 Crisp roast chicken with stuffed cabbage leaves. Hmm…I was intrigued. The cabbage leaves were stuffed with chicken confit (don’t hear that too often either), carrots, herbs, and turnips. The roast chicken was really, perfectly cooked, juicy, sitting in a mild and salty broth, all the while maintaining a crisp, golden-brown skin. This was truly a multitasking and delicious chicken. How great is chicken skin?! Perhaps the antitheses to a boring menu item like roast chicken is something that lives in the lamb family – lamb always sounds exotic compared to chicken, eh? Sweet and sour braised lamb…that sounds exciting! 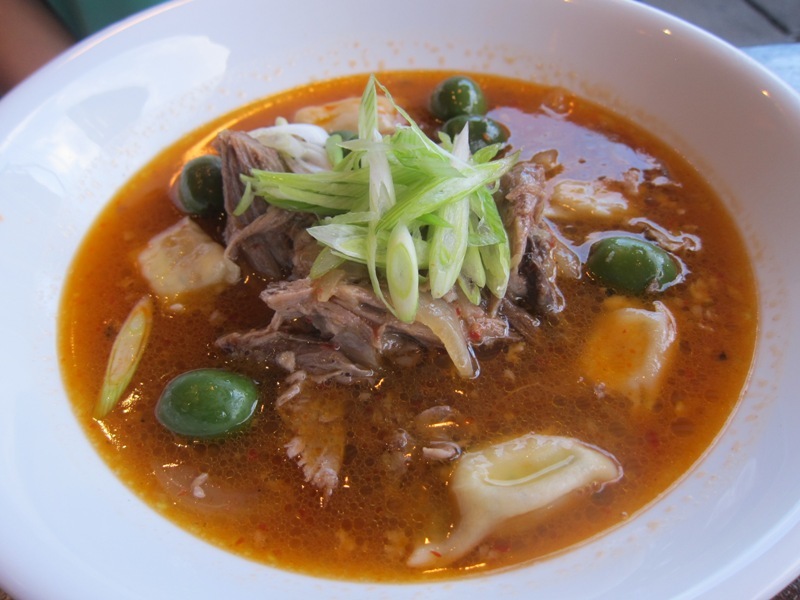 The shallow bowl was filled with a savory dark broth, studded with large green olives, and pieces of fork-tender, sweet and sour lamb. Different, tasty, and you could really taste the “sweet and sour” aspect. Yum. Despite our apathy towards dessert due to full stomach syndrome, the Chef sent out a beautiful apple tart topped with mascarpone whipped cream and glistening studs of crystal sugar on the crust. Ok…if you twist my arm. I have been avoiding sweets for a while now, and I thought I had a handle on my self control until they put this thing down in front of me. It looked so pretty, I just stared at it…then I pictured myself ripping into it like a bear tearing into a freshly caught salmon. I practiced SOME self control and had a small piece; that whipped cream changed my view of whipped cream in the world. 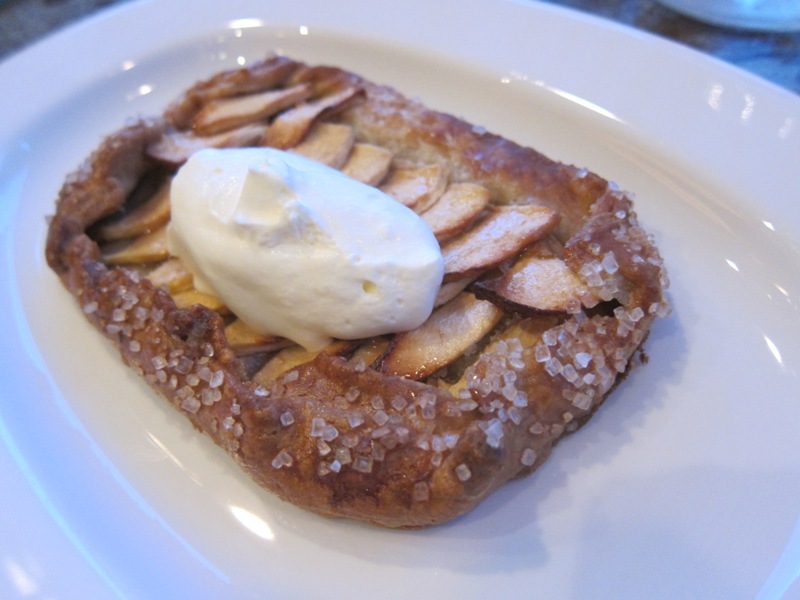 I now think an apple tart may not be the same without mascarpone folded into the whipped cream. It was more dense, a little tart, a little sweet, and so creamy. And that crust? Crisp, flaky and those sugar crystals hit your tongue and take this otherwise ordinary dessert into something more – something with flair. That’s what I would call the apple tart – an apple tart with flair. I suppose the same could be said for the restaurant itself – it’s something with flair. And a great addition to the East Village. How can you NOT eat that? These food and desserts at Calliope all look tasty and delicious. I can say food presentation really attracts the appetite of a person.